I am a General Surgeon practicing in London, Ontario. Although I work in an academic centre, I spent 7 years in community practice in Sarnia and feel I am familiar with the issues faced by both community and academic surgeons. I have been involved in provincial political issues for many years. I am the currently the section chair for general surgery at the OMA and the past president of the Ontario Association of General Surgeons. I feel that the OMA’s number one priority is to deal with the massive inequities in income that exist between various specialties. They can no longer do minor tweaks this expecting underpaid specialties to eventually rise to parity with higher paid groups. That is a ridiculous scenario that fiscally impossible. The only tenable solution is drastic cuts to overpaid specialties. I will advocate vigourously for the OMA to set a rigid timetable for relativity issues to be resolved , but I am skeptical that the OMA has the political will to be able to accomplish this. Hopefully recent events will spur the OMA to make some hard decisions. I don’t think it would be unreasonable for the ministry to act unilaterally in regards to gravy train specialties if the OMA will not commit. 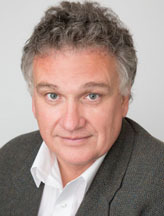 Dr. Chris Vinden is a General Surgeon at Victoria Hospital, Division of General Surgery, London Health Sciences Centre and Associate Professor of the Dept. of Surgery, Western University. He has also held the roles of Chief of Surgery Associate Chief of Staff. 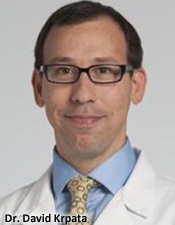 Dr. Vinden's main area of interest is colon screening. OMA Section Executive on General Surgery was acclaimed on January 20, 2017, but the terms will not commence until elections are completed (Mar., 2018). All terms are 1 year in duration. Dec.19 - Attn. OAGS Members - check your email for the latest E-Update (December)! Dec.16- Gov't will return to table and resume arbitration with OMA. Hearings RESCHEDULED to begin Tues,Dec.18 until Dec.21. More details here. Straw Poll Below - What kind of job action would you take in response to the government's withdrawal from arbitration again? 24th OAGS Annual Meeting - thank you to everyone who attended! Photos and syllabus updates coming soon! GenSurg Work Hours Survey: Deadline is Oct.20. Did you remember to complete it? OAGS Board Election Nov.3: Nomination Deadline is October 19 - Apply Online Here!! Ongoing - Attn. General Surgeons - Renew your 2018 OAGS Dues Now!! HAPPY CANADA DAY WEEKEND!!! 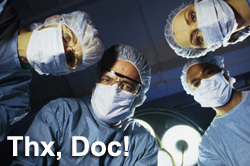 - Thanks to all our General Surgeons who are on call! June 15, 2018 - Congrats to General Surgery Residents who passed Royal College exam. For those who have to rewrite - keep the faith!! Best wishes on your journey forward. May28...- Attn. GenSurg Residents: Good luck on your exams this week! May 1, 2018 - Happy National Physicians' Day! Thanks to all our hard-working and dedicated General Surgeons throughout Ontario and Canada! Jan, 2018 - With no headway in negotiations, OMA and MOHLTC will enter binding arbitration starting in May-Oct/18. Nov.13, 2017 - 23rd OAGS Annual Meeting photo gallery now available. Save the Date for next year's 24th OAGS Annual Meeting slated for Saturday, Nov. 3, 2018! - more details. Sept, 2017 - OMA Relativity Review Committee (RRC) Survey (due Sept.17): Both Section on General Surgery and OAGS executives encourage full time General Surgeons to participate and fill out the survey accurately, but also be mindful and fastidious that every minute may count. Include in your work hours ALL clinical activities, not just hours involved in direct patient contact. (Refer to OAGS/Section email instructions dated Sept.5th and 8th.) General Surgery needs to be well represented in this data, so thank you in advance for participating, everyone! CAUTIONARY NOTE: Members are reminded that each member was emailed an individualized link to participate in the OMA Relativity Review Committee (RRC) Survey on Sept.1 and again on Sept.8. (Deadline is Sep.17.) Therefore, we cannot post a generic link to the survey. The survey links were sent to each OMA physician with an active practice only - not retired, residents, fellows, etc. They were emailed via the OMA "ThoughtLounge" platform. If you've deleted it by accident, please try to retrieve it from your bin. If you haven't been receiving "ThoughtLounge" emails from the OMA at all, please check your spam folder or your old email accounts. If you unsubscribed or need to update your contact information, contact OMA Membership and specifically request a relativity survey: membership@oma.org AND cc: AskERA@oma.org . Alternatively, you can call the OMA directly: 1-800-268-7215. Aug/2017 - Did you RSVP for our Annual Meeting on Nov.11 yet? Deadline for group rate hotel reservations is Oct.20! June 19 - The results are in! OMA members voted 65% to 35% in favour of ratifying the Binding Arbitration Framework Agreement on June 17. Now the OMA/MOHLTC can move on and begin negotiating a new contract for Ontario's Doctors no later than September 1st, 2017. May 28 - The OMA Negotiations Committee invited all Sections to submit their respective wishlist or negotiation priorities list. Jointly discussed by both OAGS and Section executives, the Section on General Surgery wishlist can be downloaded here. May 8 - Two GPs take over the helm of the OMA Executive Committee. 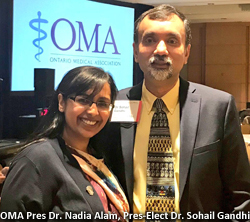 During the recent OMA Council Meeting, delegates elected Dr. Shawn Whatley as the new OMA President and the Coalition's Dr. Nadia Alam as the new OMA President-Elect. May 1-7 is Mental Health Week. Check out our own Healthy Surgeon page for helpful resources. Also, the CMA and OMA will be hosting the 5th Canadian Conference on Physician Health this fall (Sept. 7-9). May 1 - Happy Doctors' Day! Thanks to all our General Surgeons and General Surgery Residents/Fellows for their service and care. It is greatly appreciated! Mar.4-5 - The OMA Physician Action Working Group (PAWG) held a meeting for all section and district reps to present their job action perspectives. OAGS President and Section Vice Chair Dr. Alice Wei participated on behalf of General Surgery. PAWG will review all feedback when considering potential job action if contract negotiations with the MOHLTC do not resume. Mar - OMA wants your opinion on Job Action: Take survey now! Feb.27 - In the absence of an elected OMA executive, the board has appointed Dr. Rachel Forman to serve as primary spokesperson. Feb.7 - After careful consideration of the recent Special Council voting results, the OMA President and Executive have since decided to resign their positions (Feb.6). In doing so, the hope is to reunify doctors and refocus a strong front against the gov't. However, those who are resigning from the Executive and still in the middle of their 2yr term will remain on the OMA Board of Directors. Any Board vacancies will be voted on by Council. From this slate of Board Directors, a new Executive will be nominated and elected during the usual Spring OMA Council Meeting on the weekend of May 6-7, 2017. Please refer to the OMA Bylaws for more details. Until then, the OMA Board at large will be in a position of power and decision making. 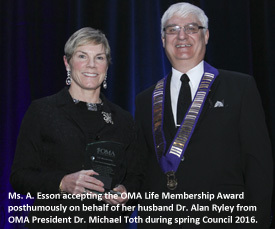 OMA Press Release; OMA Membership Update (gated). 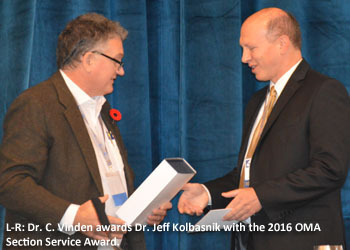 Congratulations to Dr. Jeff Kolbasnik who received the 2016 OMA Section Service Award during the 22nd OAGS Annual Meeting on November 5, 2016. 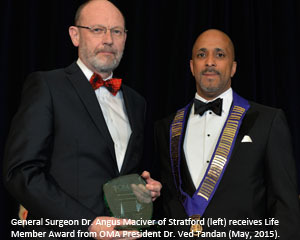 During the OMA Council banquet earlier this spring, two General Surgeons were recognized with the OMA Life Member Award for their years of service to the OMA Section on General Surgery, OAGS and numerous committees. Congratulations to Dr. Suru Chande of Ottawa, Ontario and the late Dr. Alan Ryley of Burling, Ontario - the latter of whom received it posthumously by his wife Ms. A. Esson. 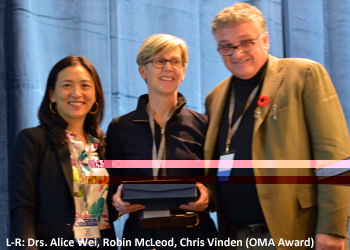 Congratulations to Dr. Robin McLeod who received the 2015 OMA Section Service Award during the 21st OAGS Annual Meeting on November 6, 2015. 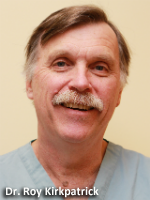 Congratulations to Dr. Angus Maciver of Stratford, Ontario. 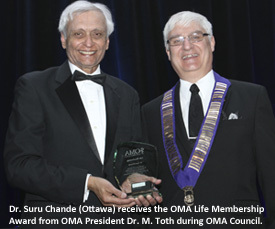 During the OMA Council banquet earlier this month, he received the OMA Life Member Award for his years of service to the OMA Section on General Surgery, OAGS and numerous committees.